JS13k 2018 has gone by! this is the third of a series of posts detailing my journey, as well as the structure of the game I built. You can play it online here! Following is a summary of the 43136 bytes, which of course could be laid out in a much better, modular way, but were thrown together in a huge file for the sake of reducing overload from webpack for having multiple modules. So, why do I think this may be relevant? Well, I believe this may be a bare minimum setup to have an arcade game up and running; understanding how these components work together to create the game experience might be helpful to create a more organized structure, without falling on the mistake of over-engineering (start small and simple!). Also, having them all in a monolithic block creates an implicit graph of dependencies, where the more general purpose components are (generally) defined first, then other code uses them. 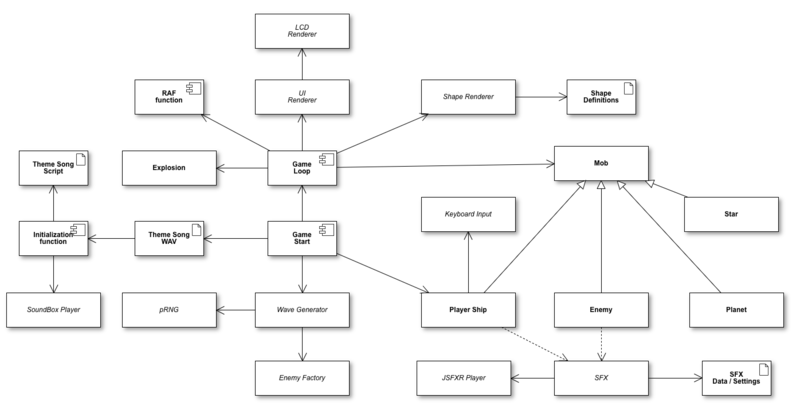 Here’s a first stab at translating that to a component / class / object diagram. With each segment of the source code, I’m including a short description which may give you an idea of the types of components in play for the game, here we go! Soundbox player (11879 bytes): Pasted from here, this is the code that interprets the song “script” and transforms it into a WAV stream. Theme song (5148 bytes): Created by Ryan Malm, it’s exported from Soundbox online player. Initialization function (466 bytes): Creation of the music player and the WAV stream from the song script. SFX playback functions (359 bytes): Preload Audio objects from SFXR sound data and allows easy playback. pRNG functions (719 bytes): Functions to generate random numbers, including the seedable pRNG. Keyboard input routine (533 bytes): Some hooks around keypress and keydown to allow polling for the state of a key or add a listener function. Shape renderer (1765 bytes): Given a canvas rendering context, a set of “shape instructions”, a position and a scale value, translate the simplified instructions into Canvas 2D API operations. Mob class (887 bytes): Model the basic things moving around in the world, every Mob has an appearance, speed, and position in the x and y axis. This class also includes functions to update the mob, destroy it and check collisions with other mobs, as well as the creation of explosions. RAF function (401 bytes): Function that allows hooking other functions into an animation frame, doing the fundamental calculations for the elapsed time between frames which are used to (try to) keep things running at a constant speed regardless of where they are run. Collision functions (177 bytes): Simple collision checks based on the Manhattan distance between two mobs and their size. LCD-like number rendering (805 bytes): Allows drawing any number as an LCD-like display. UI Rendering (1371 bytes): Depending on the current state of the game, might draw the loading message, or the title screen, or the HUD including the scores and the current wave, or the Game Over message. Player Ship class (2356 bytes): Extends Mob, has special checks on its update function to simulate inertia as well as handle the practical “3d” effect when moving around and keeping the player ships on-screen. Of course, it also includes functions to control the movement of the ship using the keyboard (the actual keys that are used are received as a parameter, which means there could potentially be more than 2 players on screen). Also allows firing missiles, and keeps track of a player’s score. Star class (304 bytes): Extends Mob refining the destroy class so that a new star is created at the top when a star is destroyed. Planet class (366 bytes): Extends Mob defining a special render function which draws a circle filled with a gradient based on the 2 colors and rotation of the planet. Explosion class (928 bytes): This class is similar to Mob, but explosions have no speed (just a position). It’s designed to progressively draw an explosion on screen, based on the “run time” and “size” parameters, the size and color of the circle to be drawn are determined by the “progress” of the animation (a value growing from 0 to 100, based on the accumulated render time and the total run time). When fading, it substracts from the drawn circle creating a growing “hole” inside of it. Enemy Wave Generation (1947 bytes): Several functions containing the logic to create a new “wave” of enemies. Levels are made of waves generated every 3 seconds, this component decides what enemies will be spawned on each wave, and under what behavior. Makes extensive use of the seeded pRNG, as well as the Enemy Factory. Also creates the planets. Enter key handler (320 bytes): Used to control the game state from the title screen and game over status, into the “in game” status. Coming up next, final postmortem and future of the game!